Forty days of devotionals written by women who want to discover how to live a life that impacts those around them. Can be used by individuals or in small-group studies. Whatever your gifts, passions, or stage of life, you can make a mark on people around you. Don't wait for what will be. Instead, begin now. God wants to use you in your everyday life to bless others. Pastor Debbie Morris writes in the introduction: "If you have asked Jesus into your heart, you are accepted. Your quest to make a mark is not to find significance. You have significance. You are loved. You are highly favored. You are known by God. You are special." 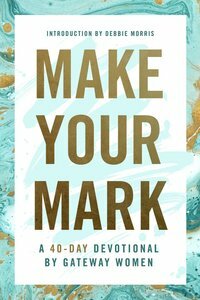 About "Make Your Mark: A 40-Day Devotional By Gateway Women"